The first is multi-dock lineup from XtremeMac called InCharge(pictured above). The company introduced three models: InCharge X5, InCharge X3 and InCharge Duo Plus. All docs are almost identical with LED status indicator, 10 watt per dock, “case-friendly” charging slots and rubber feet. The company plans to release the docks in the first quarter of 2012. According to iLounge, the X3 and X5 will cost $100 and $150 respectively. The second charging solution is the Syndee multi-dock from Kanex (displayed below). 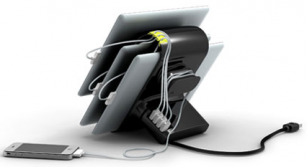 This model can hold up to four iOS devices simultaneously through its USB ports. The press release said that it will be available in white and black by the end of the first quarter. The pricing information is not given, but SlashGear claimed it will cost $150. Atona is showing off a new accessory LinkCast Wireless HD Audio/Video System. One unit of the system plugs into the iOS device via the HDMI out and another plugs into the HDMI input on a projector or a TV. After that you can wirelessly send content to the TV screen with support for uncompressed video up to 1080p resolutions, including 3D video. The LinkCast will launch in the first quarter and will cost $300. 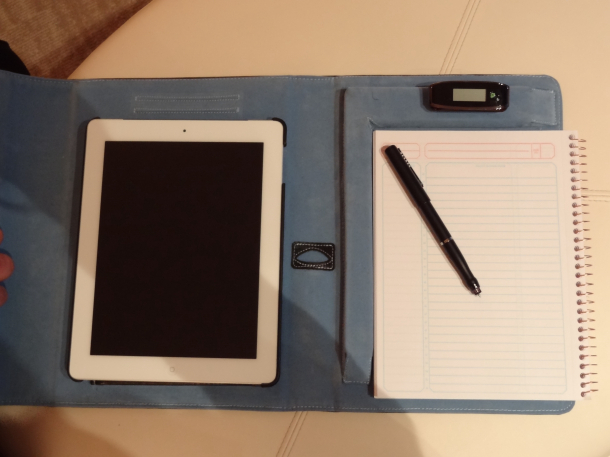 iNotebook from Targus offers accurate handwriting and drawing recognition, allowing you to write something on the notepad and instantly have it sended to your iPad. It is still a working prototype, but according to Cnet, it will look nicer, when it launch this year. It utilizes a free app which saves data on iCloud and allows you to edit your notes within the app using the pen’s stylus, which doesn’t scratch or smudge the screen. Targus will release the iNotebook in June for $150. Griffin’s Kiosk for iPad is obviously intended for business customers. It supports both landscape and portrait mode and offers an adjustable viewing angle. It can be used with 50-inch floor mount ($300) or a 12-inch surface/tablet mount ($199), and various faceplates to restrict or allow access to the camera and home button. For security reasons, the dock connector is hidden and cables go inside the steel stand. Also it will come with hardware for mounting Kiosk to a floor or a surface when it launch in March.